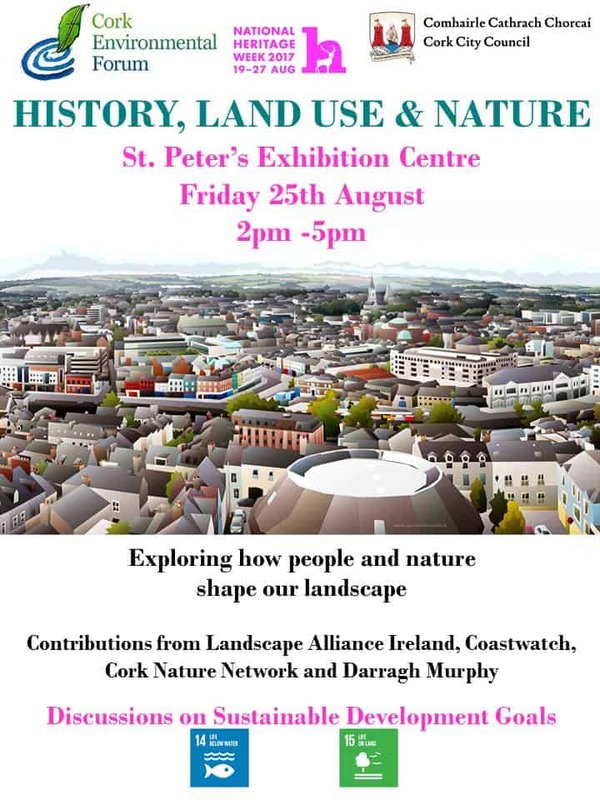 We are pleased to be hosting a number of events in Cork which highlight this year’s Heritage Week focus of shining a light on nature. The event will also offer an opportunity to explore and discuss how we might support implementation of the most relevant SDGs in an Irish context. The event is FREE and open to all, however, booking to bernadette@cef.ie would be appreciated. 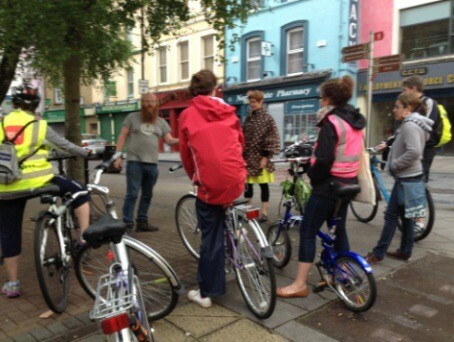 Wednesday August 23rd at 7 p.m.
All tours are FREE & start from St. Peter’s Exhibition Centre, North Main Street, Cork. They are appox 1 -1.5 hours duration. Hope everyone enjoyed the long weekend and had a great Lá Féile Pádraig. This is just a quick reminder of a few upcoming events, all listed below. This includes a talk on 2nd April in the County Hall by Cal McCarthy in commemoration of Cumann na mBan – Centenary Day. There are also two avenues of funding open at present, Cork County Council’s Amenity Grants Scheme and the Irish Georgian Society’s Conservation Grants Scheme. For a number of years Cork County Council has been operating an Amenity Grants Scheme. 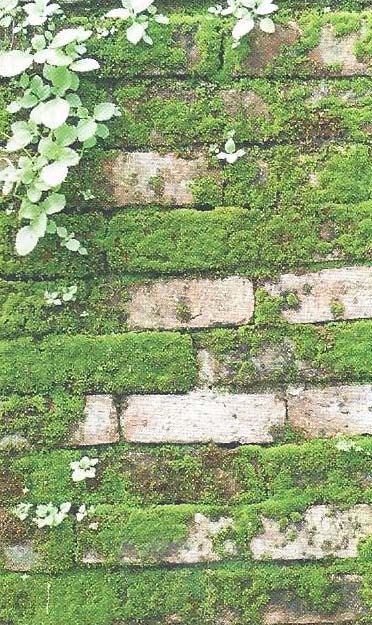 The general purpose of this Grants Scheme is to aid and encourage works and public amenity schemes for the benefit of residents in the County of Cork. The works that qualify for consideration for amenity grant schemes include the provision or improvement of amenities and the provision of community facilities. Some community based heritage projects/initiatives would also in principle fall under this scheme. Applications are handled separately for each of the County’s three divisions and for guidelines and application forms, please see the following link – Cork County Council Amenity Grants Scheme. Please be advised that the closing date for applications is 5pm on 17th April, 2014. The Irish Georgian Society, through the support of its London Chapter, has launched a new Conservation Grants Scheme to provide financial assistance for works to structures of significant architectural merit. The scheme will operate over a four year period with funding of approximately €50,000 to be made available this year. The closing date for applications is 28th of March, 2014. More information about the grant and the application form can be found by accessing the Irish Georgian Society Website. Location: Coláiste Stiofáin Naofa, College of Further Education, Tramore Road, Cork. Additional Information: The students of Cultural & Heritage Studies in Coláiste Stiofáin Naofa College of Further Education, Tramore Road, Cork have been visiting and photographing a number of holy wells in the Cork and Kerry and further afield. To this end, they have put together an evocative photographic exhibition detailing the unique nature and character of these sites. Central to the exhibit is an installation of a ‘Rag Bush’ with its eclectic collection of religious and secular paraphernalia. A number of historical images depicting the activities of the pattern day have been reproduced and the entire display is to be enjoyed with a carefully chosen soundtrack. The exhibition runs at the college from Wednesday 26th March until the end of May 2014. The exhibition will be launched by Dr Stiofán Ó Cadhla, head of the Department of Folklore, University College, Cork. Location: Parish Centre, Clonakilty, Co. Cork. Additional Information: Traditionally so called ‘strong farmers’ used to arrange the marriage matches of their sons and daughters. Instead of inheritance upon death of a family farm, this allowed the elders to retire and have a younger couple take over while they were still alive. Hard bargains were struck over dowries, some involving matchmakers. Those who rebelled against having their marriages arranged for them, resorted to some intriguing alternatives. As part of Dr Claudia Kinmonth’s decades of research into Irish farmhouse furniture, and then into previously little known paintings that depict rural marriage, this illustrated lecture tells the story of arranged marriage through copious images. Juxtaposing poems with early documents and texts, as well as a wealth of images, a social history of Irish marriage unfolds. Claudia is the author of the award winning book ‘Irish Country Furniture 1700-1950’ and subsequently of ‘Irish Rural Interiors in Art’ (both published by Yale University Press, 1993, 2006). She lectures and broadcasts widely and has been involved with several exhibitions of Irish genre painting. Signed copies of her second book will be available on the evening, for purchase. Location: Council Chambers, Cork County Council, County Hall, Cork. Additional Information: Cal McCarthy will give a talk on the organisation Cumann na mBan on this their Centenary Day. A most informative talk not to be missed and all welcome on the day. Location: Methodist Church, Kinsale, Co. Cork. Additional Information:>”Kinsale Medals” An Illustrated Talk by Denis Gimblette. For more information contact dermotryankinsale@gmail.com or phone Tony Bocking at 021 4772500. Location: Scoil Mhuire Gan Smál (Blarney Secondary School), Blarney, Co. Cork. Location: To be confirmed but either Glenbower Woods (Killeagh) ro Beaumont Quarry (Cork City) – contact Lorna O’ Mahony on 085 7329374 for more info. Additional Information: This event is a family event. It is suitable for up to 20 children, ages 4-10. It will run from 1pm -3pm. All children must be accompanied by an adult.Numbers need to be known in advance in order to provide equipment for the children. Contact Lorna O’Mahony (details below. For this event warm, waterproof clothing, wellies or sturdy waterproof boots are recommended. This event is free – however donations are welcome to cover costs. On this Bug Hunt Ecologist Lorna O’Mahony will explain the wonders of the miniature natural world in this family fun filled activity. You will have the opportunity to catch little critters in the undergrowth using amazing science equipment and also learn some cool mini beast facts. This is a fun event for the entire family. Please contact Lorna O’Mahony on 085 7329374 with numbers attending and any other queries regarding this event. Additional Information:>An exhibition and seminar on World War 1 at the Methodist Church in Kinsale with the exhibition taking place on Friday and Saturday. For more information contact dermotryankinsale@gmail.com or phone Tony Bocking at 021 4772500. Event: Guided Bat Talk at The Lough Cork, city with Conor Kelleher from Cork County Bat Group for Life Long Learning week. Location: Meet at the Hawthorne Bar beside the Lough, Cork. Location: Ballincollig Rugby Club, Ballincollig, Co. Cork. Additional Information:Muskerry Local History Society presents a lecture by Dermot O’ Donovan titled: “The Riots in Marsh’s Yard” which will tell the story of what happened in Marsh’s Yard in 1938 which led to the shooting anddeath of Michael Patrick Lynch. Please note that there is a nominal attendance fee of €3.